Warning that the wider international community’s idea of “development” disregarded their unique concerns, speakers at the United Nations Permanent Forum on Indigenous Issues today called on Governments and intergovernmental agencies to ensure that indigenous peoples were active participants in designing, implementing and monitoring global strategies to eradicate poverty and protect the environment. With the end of the just-launched Second International Decade of the World’s Indigenous People coinciding with the 2015 benchmark year for the achievement of the Millennium Development Goals, representatives of indigenous groups, on day two of the Forum’s annual session, cautioned that, in many cases, development could be a double-edged sword, robbing indigenous peoples of their land and resources. And, in the context of globalization, indigenous peoples were often forced to play the role of bystanders when decisions were made, even though their children would inherit the environmental costs of industrialization projects. In the first of two interactive panels today devoted to frank consideration of ways the Goals might be recast with an indigenous perspective, some speakers pointed out that aggressive national and multinational corporations with invasive oil, lumber, pharmaceutical and strip-mining practices were threatening indigenous communities and traditional lands. Others noted that indigenous peoples were “the experts of their forests, plains and deserts”, and their knowledge and wisdom should be used in drawing up international environmental policies and strategies. 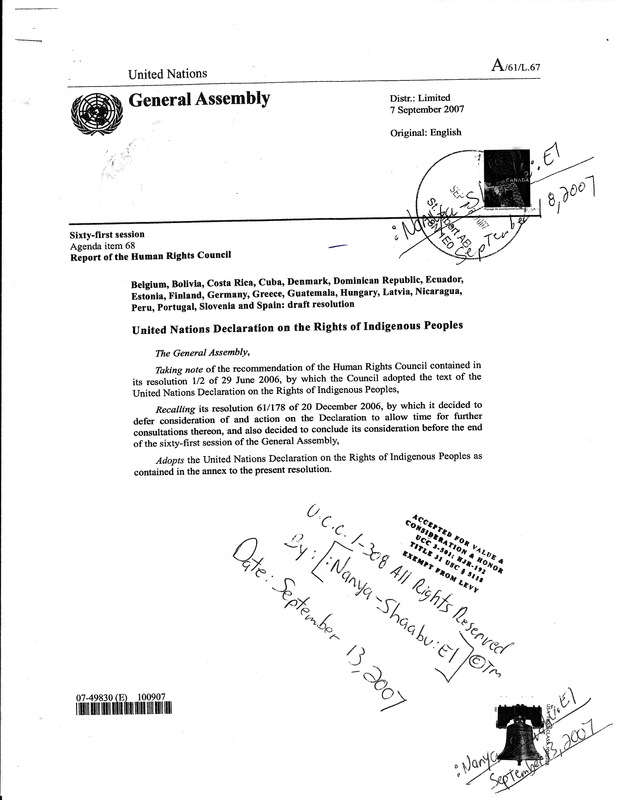 Overall applicability of Millennium Development Goals to the development of indigenous peoples needed to be substantiated by statistical data, one speaker said, adding that it was difficult “to prove that you are among the most oppressed if the Government does not keep records in that regard”. For instance, the only group for which data was not available for immunizations in the United States was indigenous children. During the second panel, which featured representatives from nearly 20 United Nations agencies and programmes, as well as global development partners, speakers stressed that indigenous peoples must be fully empowered to play their role in achieving the globally agreed Goals -- ambitious targets, ranging from halving extreme poverty, to halting the spread of HIV/AIDS and to providing universal primary education, all by 2015 -- as well as the United Nations broader goals in the areas of peace, human rights and sustainable development. One representative said that, for United Nations entities, as well as other international organizations, further inter-agency cooperation and coordination was necessary to provide more data and channel more resources for case studies and other research on indigenous people and their communities. Sharing information was particularly important, in order to study the nexus between indigenous people and migration in such areas as displacement, preservation of languages and cultural identities and the elaboration of culturally sensitive polices. With that in mind, a representative of the United Nations Educational, Scientific and Cultural Organization (UNESCO) said that, if the implementation of the Millennium Development Goals were to benefit indigenous people, cultural diversity must be taken into account. But, to date, cultural diversity had not been well enough understood or adequately considered as part of the discourse, policy thrust or practice of development. In order for that to change, indigenous peoples must be consulted on and allowed to participate in the elaboration of global development plans and initiatives. A representative of the Joint United Nations Programme on HIV/AIDS (UNAIDS) acknowledged an interesting cultural dichotomy, noting that, while, on the one hand, there were arguments that the absence of data on HIV prevalence rates among indigenous communities might lead to neglect or invisibility, on the other, collection of such data might fuel stigma and discrimination. But, the Programme had, nevertheless, identified several key areas where the Forum could perhaps make a difference, including working with relevant United Nations agencies and partners in developing a set of resources highlighting effective approaches and best practices of HIV prevention and AIDS care in indigenous communities. The Forum will reconvene at 10 a.m., for an interactive dialogue with Member States on the Millennium Development Goals and indigenous peoples. Participating in the dialogue with the Forum’s 16 independent experts on the special theme of the session -- Millennium Development Goals and indigenous peoples: redefining the Goals -- were representatives of the following indigenous groups and organizations: Andrea Carmen, Wendall Nicholas and Manuel Pino of the International Indian Treaty Council; Chief Mike Smith and Larry Whiteduck of the Assembly of First Nations; Ana Maria Guacho of the Latin American Caucus; Eldar Seyitbekir of the Crimean Tatar Perspective organization; Kim Thach of the Khmers Kampuchea Krom Federation; Les Melzer of the Foundation for Aboriginal and Islander Research Action Aboriginal Corporation; Kathy Malera-Bandjalan of the National Aboriginal Communal Control Health Organization; Albert DeTerville of the Caribbean Antilles Indigenous Peoples’ Caucus and the Diaspora; Joan Carling of the Asia Indigenous Peoples Caucus; and Mary Simat of the African Caucus. Also, Raphael Thangmawia of the Zor Reunification Organization; Ali Aii Shatu of the Mbororo Social and Cultural Development Association; Catherine Davis of the Te Runanga o Te Rarawa; Meenakshi Munda of the Indian Confederation of Indigenous and Tribal Peoples; Alberto Saldamando of the International Indian Treaty Council; Kati Eriksen of the Arctic Regional Caucus (Saami Council); Nanya-Shaabu of the Atosik Hata Clan of Yamassee American Moors; Chenny Yang of the World Hmong Peoples Congress; Santiago de la Cruz of the CONAIE Confederacion de las Nacionales Indigenas del Ecuador; Nicholas Chango of the Defensoria de los Pueblos Indigenas del Ecuador en America; Hilda Lini of the Pacific Caucus/Turaga Nation; and a representative of the Women’s Caucus. Agreeing on the urgent need to redefine the Millennium Development Goals to better reflect the needs and aspirations of indigenous peoples and ensure their full participation in decision-making, several speakers said that their right to development was currently not fully realized. In fact, in many cases, development could be a double-edged sword for indigenous peoples, robbing them of their land and resources. The invasion of national and international oil, lumber, pharmaceutical and mining corporations led to serious violations of indigenous communities’ rights. In the context of globalization, indigenous peoples were often forced to play the role of bystanders when decisions were made, even though their children would inherit the environmental costs of industrialization projects. They often suffered from conflicts and military invasions, which were caused by outside interests alien to indigenous communities. Several speakers insisted that indicators of poverty and development needed to be adjusted to reflect indigenous peoples’ real situation. Applicability of Millennium Development Goals to the development of indigenous peoples needed to be substantiated by statistical data, a representative of a group said. It was difficult “to prove that you are among the most oppressed if the Government does not keep records in that regard”. For instance, the only group for which data was not available for immunizations in the United States was indigenous children. Participants called on the Forum to stress the right to free, prior and informed consent of the communities concerned and the implementation of their right to self-determination. Another need was the development of a legal system to protect indigenous peoples’ rights. States should be encouraged to establish multinational standards that would respect, protect and fulfil indigenous peoples’ collective human rights in the light of the impact of corporations that negatively impacted their lives. It would not be possible to reach the Millennium Development Goals, as far as indigenous peoples were concerned, unless their human rights were respected, a participant of the debate said. As an example, she mentioned the Nordic Saami Convention -- a legally binding treaty, which was submitted to the Governments of Norway, Sweden and Finland in November 2005. The Convention drew up pan-Saami laws and defined self-determination for a people spread over three countries. It would have to be approved by the Saami parliaments before it was ratified by the States involved. Indigenous peoples in the Nordic region had a particular need for access to land and water and faced violations of their subsistence hunting rights. There was a need for clarification of several concepts on the basis of tolerance and inclusiveness. The agreement, among other things, sought to reinstitute traditional land uses. A speaker said that it was important for the Millennium Development Goals to be combined with the Second Decade for the World’s Indigenous Peoples. In pursuing the goals of the Decade, plans of action needed to be developed not only at the international, but also at regional and local levels. He also suggested that States should report to the Forum on their implementation of the Millennium Development Goals in relation to indigenous peoples. Participants in the dialogue also expressed concern regarding health issues, including the spread of infectious diseases and maternal, child and infant mortality. One speaker drew the Forum’s attention to sterilization of indigenous women without their consent and the use of indigenous people as medical test cases for contraceptive studies. She urgently asked the Forum to assert and support indigenous women’s right to make decisions regarding their own reproductive rights and to advocate full access to all sexual health education and health-care services. Another speaker expressed concern regarding the aboriginal health situation in Australia, saying that life expectancy among those people remained very low. The Government did not provide the aboriginal people with the ability to lead safe, healthy lives with dignity. There was no equality in the provision of health services, and it was necessary to improve indigenous peoples’ access to mainstream services, even in remote settings. The role of pharmaceutical companies in bioprospecting and plundering of traditional medicinal plants was discussed, as well as the need to request compensation for the use of traditional resources and knowledge. One speaker called for a halt in the creation of destructive infrastructures and development of exploitative practices until a fair legal framework for the relationship between large corporations and indigenous peoples could be worked out. In that connection, the importance of preserving traditional practices, culture and knowledge of indigenous peoples was stressed in the debate. A speaker said that it was necessary to draw further attention to the need to ensure peoples’ traditional activities in the indigenous environmental context in Africa. Others pointed out that indigenous peoples were “the experts of their forests, plains and deserts”, and their knowledge and wisdom should be used in drawing international environmental policies and strategies. It was also important to stop the loss of over 5,000 native languages and cultures and uphold the linguistic rights of indigenous peoples. There was also a call for the creation of a database to compile best practices and studies related to indigenous peoples. One participant said that the Permanent Forum should assess the human rights situation of all indigenous peoples, including those living in developed countries. The Forum Devoted the Second half of its work today to a discussion with representatives of United Nations agencies, programmes and funds, including: Elizabeth Gibbons, Chief, Global Policy Section, United Nations Children’s Fund (UNICEF); Helen-Marie Gosselin, Director in the New York Office of the United Nations Educational, Scientific and Cultural Organization (UNESCO); Angela Melo, Human Rights Adviser, and Sonia Martinelli-Heckadon, Programme Specialist of the United Nations Population Fund (UNFPA); Luca Dall’Oglio of the International Organization for Migration (IOM); Lilly Rodriguez of Ecuador’s Thematic Group on Indigenous Issues; and Marco Ferroni, Deputy Manager, Sustainable Development Department, Inter-American Development Bank. Also: John Scott for the Secretariat of the Convention on Biological Diversity; Sam Johnson, Senior Research Fellow from United Nations University; Selman Erguden, Chief, Housing Policy and Development Section and Coordinator of the United Nations Housing Rights Programme, for the United Nations Human Settlements Programme (UN-HABITAT); Navin K. Rai, Lead Social Development Specialist for the World Bank; and a representative of the International Labour Organization (ILO). While most of the speakers highlighted their agencies’ initiatives and work on behalf of the world’s indigenous people, some offered concrete strategies aimed at helping indigenous communities take advantages of the heightened international focus on achieving the Millennium Development Goals by the 2015 target date. Some also responded to the recommendations made by experts at the Forum’s previous session. Other interventions spotlighted specific initiatives to address the concerns of indigenous women, rural tribal communities, indigenous youths, housing, urban migration, and capacity-building to help indigenous communities work in greater harmony with mainstream cultures for the benefit of all. The Inter-American Development Bank’s representative said that this past February, the Bank’s Board had approved an operational policy on indigenous peoples and a strategy for indigenous development, the framework for an overall “development with identity” initiative through which indigenous peoples would reduce material poverty and improve their well-being from their own cultural perspectives and respecting their individual and collective rights in harmony with their environments. The framework also sought to reduce discrimination in the labour market and in access to social services, and foster the “intercultural economy”, which sought to mobilize the comparative advantages of indigenous assets in natural, cultural and social resources. In a related intervention, a speaker from the United Nations Educational, Scientific and Cultural Organization (UNESCO) said that, if the implementation of the Millennium Development Goals were to benefit indigenous people, cultural diversity must be taken into account. But, to date, cultural diversity had not been well enough understood or adequately considered as part of the discourse, policy thrust or practice of development. In order for that to change, indigenous peoples must be consulted on, and allowed to participate in, the elaboration of global development plans and initiatives. The representative of the International Organization for Migration (IOM) said that, for United Nations entities, as well as other intergovernmental organizations, further inter-agency cooperation and coordination was necessary to provide more data and channel more resources for case studies and other research on indigenous peoples and their communities. Sharing information was particularly important, in order to study the nexus between indigenous peoples and migration in such areas as displacement, preservation of languages and cultural identities and the elaboration of culturally sensitive polices. Indigenous peoples around the world are today celebrating the UN General Assembly’s approval of the Declaration on the Rights of Indigenous Peoples. The declaration was approved by an overwhelming majority in an historic vote in New York today. The vote is the climax of 22 years of intensive debate and negotiation. Australia, New Zealand, Canada and the United States voted against the declaration, whilst 143 nations voted in favour and eleven abstained.